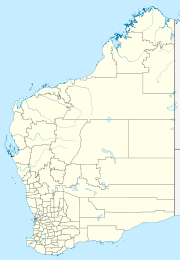 Balingup is a town in the South West of Western Australia, 241 kilometres (150 mi) south of the state capital, Perth, and 31 kilometres (19 mi) southeast of the town of Donnybrook. The town takes its name from Balingup Pool, located on the Balingup Brook which flows through the town. The name was first recorded by a surveyor in 1850, and is said to be derived from the name of Noongar warrior, Balingan. Other research by Noongar academic and researcher Len Collard has shown the name derives from the language, meaning "one that is situated there at this place". The town is on the South Western Highway. It originally had a station on the railway line, opened in 1898, the same year the town was gazetted. Balingup was known in the twentieth century for fruit and vegetable growing, and more recently for beef cattle and "magic mushroom" farming. There are two long-established religious communities. Balingup hosts annual rural festivals, primarily the Small Farm Field Day (late April) and Medieval Carnivale (August). Nearby are found mushroom varieties of interest to both drug users and law enforcement agencies. Balingup is also one of the few towns through which the Bibbulmun Track passes. Balingup is also the home of local artist Sally Darling, who specialises in portraits and Japanese paintings. The historic Southampton homestead is nearby. A bushfire swept through the area in 2013 reducing the Southampton homestead to ruins. ^ Australian Bureau of Statistics (25 October 2007). "Balingup (State Suburb)". 2006 Census QuickStats. Retrieved 20 September 2008. ^ "Notes of Balingup District". Western Mail. Perth, Western Australia: National Library of Australia. 10 December 1910. p. 12. Retrieved 3 February 2011. ^ "WA Police target 'magic mushroom' harvesting in South West town Balingup". Perth Now. 9 August 2016. Retrieved 3 November 2018. ^ Alicia Hanson (14 February 2013). "Historic Southampton Homestead lost in Balingup fire". Australian Broadcasting Corporation. Retrieved 19 March 2013. This page was last edited on 3 November 2018, at 07:58 (UTC).